Mike Swenton, vice president, became a Rich & Cartmill, Inc. partner in 1979. He began his insurance career in 1973 as commercial insurance underwriter in the Travelers Insurance Company’s Tulsa office. In 1976 he joined Marsh & McLennan, Inc., where he advanced to assistant vice president. 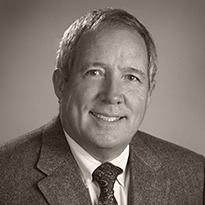 Mike received his CPCU designation in 1977, and has served as president of the Northeastern Oklahoma Chapter of CPCU. He also periodically instructs CPCU candidates for the local chapter’s educational program. He received his CIC designation in 1991. A graduate of the University of Oklahoma with a Bachelor of Science degree in Business Administration, he was a three-time All-Big-Eight Conference outfielder with the OU Sooners. Mike is an avid outdoorsman, particularly with hunting and fishing interests.